Specially designed for the Zhiyun Crane 2. The motion sensor remote control can remotely control all kinds of stabilizer operations in real time with transmission range of up to 10m. 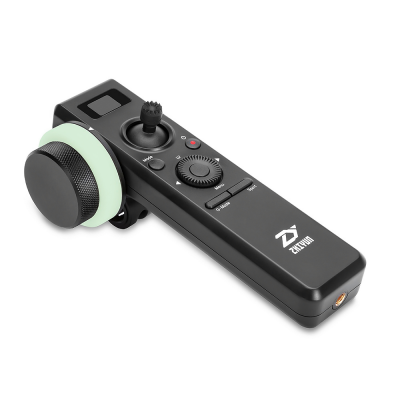 With a quick control dial design,you can adjust camera and stabilizer parameters and realize one-hand operation without need to connect to any phone App,simplifying your shooting significantly. White marking ring adopts luminous materials,giving you precision follow focus at night.You can also use markers to mark the positions of rotary knob for various shooting needs. The remote control can be installed easily anywhere anytime.No matter being used separately or installed on dual grip or extension rod,the remote control can give you smooth and sensitive control over your stabilizer. Note: Crane 2's Controllability to Cameras may Vary Depending on the Specific Camera Brand and Model. With the optional "Servo Follow Focus", Crane 2 supports real time follow focus for All DSLR and Mirroless Cameras Canon Nikon Sony Panasonic.